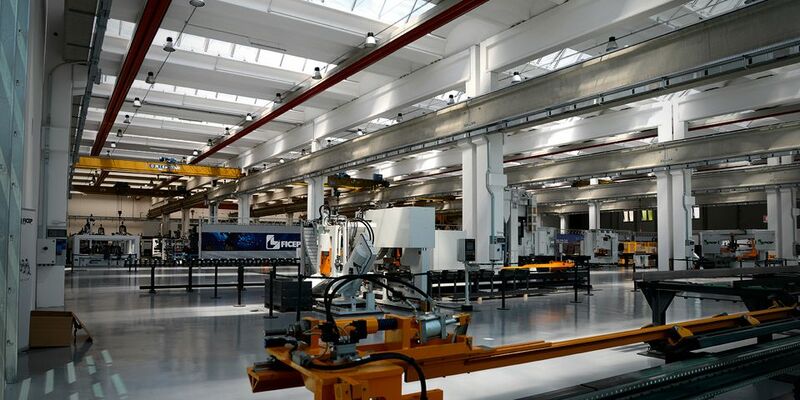 Thanks to our permanent show-room of 2,000 m² within the Ficep Academy, at our headquarters in Gazzada, we can make machines of all sizes available to all our clients. To define it dynamic is not a habit but a real fact: the installed machines, in fact, are fully operating and can execute all the main operations requested by customers in this sector, starting directly from the drawing of the pieces to be produced and carrying out real tests on the machines on show. Our Showroom is always equipped with the latest models, visible and usable, of medium-big sizes and provided with loading-unloading systems. It is then possible to perform punching, drilling, marking, scribing, milling, shotblasting, thermal cutting (plasma and oxygen cutting) and shearing operations, all that on the typical workpieces processed in modern structural works, such as angular and flat profiles, plates, beams and tubes. The continuous care and dedication towards our customers has always been an important part of our philosophy. We give the same attention and consideration to single company visits as well as to larger groups of customers. During the year our Showroom is in fact also dedicated to welcome all visitors attending our frequent Open-House events. Visiting Ficep you will personally experience our reality and you will also have the opportunity to enjoy the nice area that surrounds our headquarters: from the breathtaking mountain chain of the Alps, to the great lakes area of Lake Garda, Lake Como and Lake Maggiore . And not least the wonderful cities of art: Milan, Florance, Venice, with its history and its beauties.